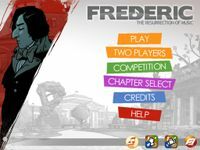 Frederic: Resurrection of Music is a humorous rhythm game that casts the player as classical composer Frederic Chopin. The game featuers a vibrant and deliberately silly cartoon storyline in which Chopin engages in multiple musical "duels." Remixes of 10 classical compositions are included, and the soundtrack can be purchased separately. The game is not a Universal App, but is available separately on iPad, iPhone, and Mac OSX.